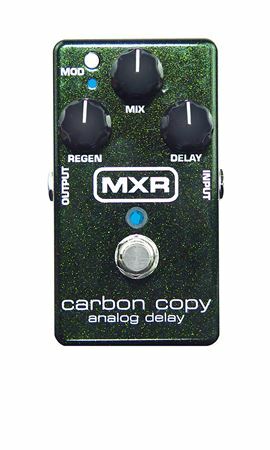 Shop MXR M169 Carbon Copy Analog Delay Pedal from AMS with 0% Interest Payment Plans and Free Shipping. 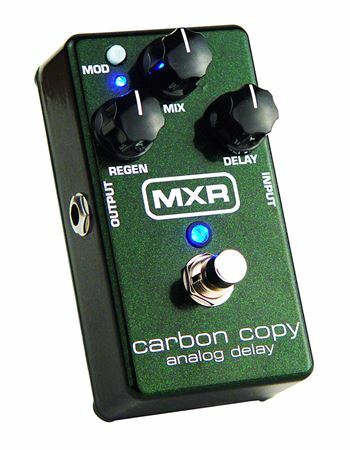 The MXR Carbon Copy pedal is the ultimate in rich warm delay because of its completely analog signal path. The Carbon Copy features 600ms of delay time with optional modulation all in a pedal no larger than the Phase 90. The modulation is controlled by a top mounted switch and there are three knobs for ease of use. The knobs control delay time, mix (dry/wet blend) and regen (delay repeats). Plus two internal trim pots offer user-adjustable width and rate control of the modulation for even more tonal control. With these tone controls you can go from crisp bathroom slap echoes to epic, Glimour-esque delays! True hardwire bypass, single 9-volt operation and stage ready blue LEDs make this a performance pedal for today's player. This is as awesome as they come! The analog delay is awesome. I love it so much more than digital! I truly suggest checking it out with American Music Supply! They keep you Rockin! Very easy to use and sounds great as well! Produces great depth and texture for my playing.